I think this is the best 500 Point Perk Sephora has offered so far. I'm glad I rarely bother to use my points on any of those deluxe samples and skipped out on the Sephora palette (first 500 point perk) or the Kat Von D "Rock N' Roll" palette. I think this is the BEST deal they've offered.. and for free! 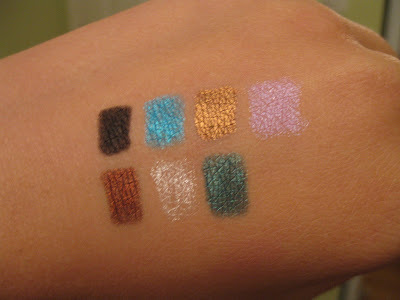 I remember the 500 point Sephora palette being dusty and the Rock N' Roll palette had terrible color payoff. These polishes are the real deal. They're actually sold individually for $9 a pop so this is a $27 (plus tax) value. My nails aren't the best but I hope I captured the colors decently. "Personal Shopper" is a basic, primary red and I got the full effect with one coat. I really like the color and it's perfect for the Holidays. "Dear Diary..." is a sheer, milky pink. The first coat went on sheer so I layered on another coat and the color was perfect. "I'm With Brad" is like a dark, burgundy brown with reddish shimmer. All the swatches were done without a base coat or top coat. Top Row: Deep Black, Blue, Copper, Mauve. Bottom Row: Brown, Silver, Green. I wore the Blue Flashy liner today for a family get together and the color was very -flashy. A super bright blue-teal color and I had to tone it down a bit and add Mauve to it. In the end, I added some black over and it turned into an amazing bright blue-black. Surprisingly, the color lasted from 5:30PM and beyond. 9 whole hours later at 2:30AM, it was still in place. It didn't budge whatsoever. I have extrememly watery eyes so I was surprised by the wonderful staying power. I actually had to remove it with some good makeup remover (I always use baby wipes to remove makeup.) NO liner has ever stayed (on my waterline and lashline) for over 2 hours -in my whole life. Not MAC, Revlon, MUFE, Tarte, Urban Decay, CoverGirl, etc.. none of those. I'm really amazed by this. If you have issues with liner always disappearing from your waterline, I'd say go for this. If you like experimenting with colored liners, go for this. If you're on a budget, go for this!!!! 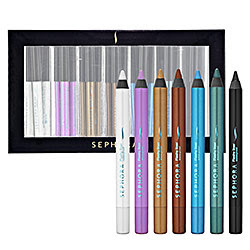 Pick one of these up while you can because they're selling out in lots of Sephora stores.